When I was a kid, growing up in the richly diverse University area, I went to most of the churches with my sister Shelley in tow within walking distance of our home. I loved singing in the choir and tried them all: Sandwich (now Bedford) United, Knox Presbyterian, Campbell Baptist, Church of the Ascension and Central United. The joy of singing was the only thing I took away from those experiences. In January of this year, when I discovered the Sandwich First Baptist Church on Peter St. near Prince Road, I knew what I'd been missing. When I entered the sanctuary, the hair all over my body stood on end. There's a spirit in this church that's alive and I'm certain it lies in the bricks of the structure itself. The original church (c 1820) was housed in a log cabin. When the congregation decided to replace it with the brick structure, every able-bodied male member of the congregation was required to make a certain number of bricks using clay from the Detroit River. Many of these bricks were made by slaves escaping through the underground railroad as payment for a meal and safe haven that had been provided by a member of the congregation. The church was completed in1851 after eight years of hard work. At this time, American bounty hunters were still allowed to track down slaves who'd escaped to Canada and they would invade Sunday services in their quest. Little did they know that those escapees were always seated in an area of the church where they could easily escape through a passageway in the floor of the sanctuary. From there they would make their way to the back corner of the church where a tunnel ran all the way to the river's edge. Queen Victoria herself deeded the land for the church and graveyard (they're still trying to find the graveyard) and the documentation is on display in the church. The property ran from Peter Street all the way to the river where the baptisms were held. Unfortunately, there is little to no documentation of the church's history to be found. When the church was abandoned in the 1970's for nearly ten years, the registry's pages to that date were torn from their bindings. There are still some members of the congregation who are descended from the original congregation but with little to no proof, it is a bit frustrating for research purposes. They've recently formed a History Committee that will endeavour to preserve what's known of the Church's past for future generations. Presently, the church hosts many Underground Railroad bus tours, especially from the United States. These tours are usually lead by their volunteer Pastor (yes, that's volunteer as in no salary), Owen Burey or Charlotte Watkins (Watkins Street is named after her family), a descendant of one of the original congregation members. There is a restoration/renovation program in progress, in which one can purchase bricks to aid their fundraising efforts. Plans include reaching farther out into the community by forming an Education and Cultural Centre at the church. During the Sandwich Towne Festival (September 10 - 17) the S.F.B.C. 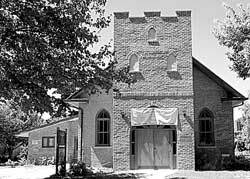 will celebrate their 160th Anniversary with full gospel choirs performing in the church each night. On Sunday night a big church dinner will top off the festivities. I cannot tell the story of this wonderful church without honouring its Pastor. Owen Burey, originally from Jamaica, started his professional career as a teacher. When his children were grown he decided he needed a change and he literally found his "calling". Owen has been volunteer Pastor of the Sandwich Pastor Church since 1985. He has helped galvanize the community to understand the historical significance of this church and has tirelessly worked to preserve it, ensuring the soul of the church lives on. In fact, thanks to Owen, the church was designated a "National Historic Site" by Parks Canada (in July of this year). Owen watches over a flock of just over 20 families at the church. He resides with his wife Detha in Chatham. Owen would love to find the escape tunnel and the graveyard and hopes someday to come across someone with the proper sensing equipment to locate them. Pastor Burey is the reason I did the story of this church. He is the spirit that has brought this church to our community's attention... Thanks Owen.